Admit it. There is nothing better than hopping on your bike and riding to a place you don’t know, just to watch the sun set. And when it becomes about the journey more than the destination, you know the biker life beckons. While these might not be Hells Angels, they come pretty close when it comes to camaraderie, experiences and passion for riding. So whether you’re a Vespa lad, a Harley girl or a Ducati stud, these clubs will welcome you with open arms. Just throw on a helmet, slap on the leather, get them boots on and get revving. All sorts of bikers and bikes are welcome here as long as they’re above 150cc. But these guys are all about safety and are rightly strict about the rules of the ride. While they take on both experienced and novice riders, make sure you don’t want to be a lone ranger as it is all about riding together. Next up is Coast Ride to Palolem, Goa which kicks off next weekend. The aim behind this community is to encourage anyone who has a passion for riding and honing their skills. Riding trips are obviously part of the agenda, and since they’re a really tight knit community, expect impromptu ride when members suddenly feel like it. Apart from tough terrain rides and long distance trips that Royal Enfields are loved for, these guys meet weekly, at least, and naturally a ride plan will come from that meeting. Try to make it to the Rann of Kutch and Spiti route. You won’t regret it. You need to be nominated by an existing member so stay connected with the rest of the tribe. Yamaha YZF R15 Riders Club started in 2014 and has grown into a large pack swiftly. Apart from skipping town often, these guys do city rides too. So if you own this stunning machine, then make sure you join these guys and their passion for riding (safely, of course). Strictly no show-off allowed here, they say. Touted to be India’s first all-girl biking community, these are a feisty bunch to join. Meant to promote women’s empowerment, they believe that biking is the path to Nirvana and we’re not arguing! Touring, stunting and racing on geared bikes of all kinds is their thing, and if you see them swoosh by on their way to work, just move over! Find the Bangalore chapter on Facebook here. Back off boys, this one is for girls who ride Bullets. Apart from rides with wind in their hair, these ladies also help those who don’t know how to ride or control these beautiful bikes. Of course, being women, they even use the group to help society. Blood donation camps, Christmas rides, long trips are all on the agenda. If you have a Yamaha in your garage, chances are that you want to hop on to it every day and just ride into the horizon. That’s pretty much what this gang does, albeit not daily. Over rides, mechanical banter and those endless roads, you’ll make new friends and your passion will only grow when you move in this pack. Created to bringing back the glory days of this home bike, the BJYMC does exactly that. Breakfast meetings, talks on riding experiences and scheduled out of town rides are what you’ll get here. But we’d join it for the history and stories that many of the members have to tell. Orange is obviously the new black and the folks on KTM Duke 390 prove that! They love to meet, wine and dine, but that is all secondary to scorching the roads of the country with their adventures. They’re also open to other bikes and bikers now, so if it’s the camaraderie you’re after, sign on up. Their current schedule sees them ride together officially on the second Sunday of every month, but weekends see them take off to places around town. Overnight trips happen about four-five times a year, so get riding now. But as per usual, safety first with them too. A group of bikers who just love to ride, these people say it’s more about the rider than the bike. That is why they are open to any bikes, but super bikes is what really brought them together. So, from Suzuki Boulevard M 1800 Rs to Ducati Monsters, bring your wheels and get ready for the ride of your life because the journey is more important than the destination. Unless the destination is a breakfast spot! Bring your Lambretta, Lamby 150, Vijai Super, Falcon, Allwyn Pushpak, Rajdoot Runabout, Enfield Fantabulus or any scooter and join this fun bunch. After all, all they need is your bike to be of classic style and nothing classic is ever bad! Another KTM owners group, you can unite over the beautiful bikes and share experiences, work on the machines and just appreciate the common passion. Plus, plan weekend getaways and long adventures while you are at it. A happy group of about 650 plus, Harley Davidson owners, they live the Harley-Davidson way of life, which means open roads and nothing but blue skies. 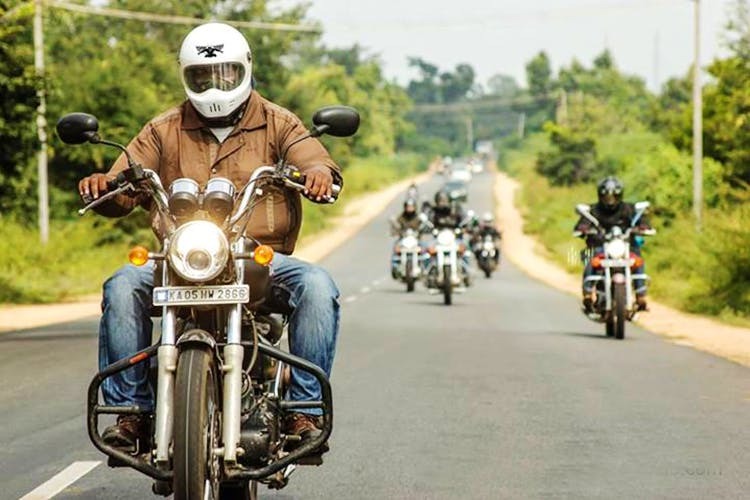 To suit the different bikes and the varied interests of riders, they organise a breakfast ride on the first Sunday of every month, a monthly over-night ride, bike nights in town, plus informal catch-up sessions and charity rides. Up next though is the HOG Rally in Goa, which is set to be the largest gathering of Harley Davidsons in the country ever. Check out the Harley Davidson India website here. If you like bikes, then the Isle of Man is eternally on your bucket list. And these folks bring you that much closer to it with an exclusive membership here. Apart from a chilled out lounge in town, meet-ups, camp outs and long trips to Kerala, Ladakh, Gujarat, and Rajasthan are all on the calendar. Plus, off bike activities like watching Valentino Rossi battling it out with Jorge Lorenzo for the MotoGP championship on television. They even organise DIY workshops to help you get to know your bike better and have a racing academy in case hitting the tracks are what you’re thinking.